"For Business boom, make slight alterations in the structure or in the placement of things, in commercial premises"
Work spaces should be harmonized as much as possible, because many people spend the prime hours of the day at work. Even if the space does not belong to you, you spend much time in it;neither is it simply a "temporary" space. Rushing through work and not respecting the environment can cause tension and hostility to the individual. Vasthu Sastra is based on the arrangements and balancing of the five elements in their proper order and proportions. These ancient sciences are still applicable in modern times. A strong votary of Vasthu Sastra, Master Yuvaraj Sowma proclaims, "Vasthu Sastra is not a question of faith, but it is a fact of life." He adds that the application of Vasthu Sastra has extended not only to residences and temples, but also to military barracks, market places, ports, administration buildings and, of course, palaces, of which many have withstood the test of time. Master Yuvaraj Sowma (email:masteryuvaraj@gmail.com; mobile:0091- 9840024470, 9790983585; Phone:0091-44-24915223) is a hereditary Vasthu practitioner, who produced CDROM and VCD on Vasthu Sastra as early as 1999 itself. He has delivered lectures around the world. The speciality of Master Yuvaraj Sowma (www.vasthusastra.com) is that he suggests ways and means of getting out of the Vasthu problems, without major demolition. He offers remedial measures to overcome the evil effects of badly constructed premises. How did you get interest in Occult sciences, especially Vasthu? How did you learn? 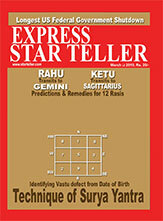 I was born in a family that has a long history of many generations of Astrologers and Vasthu Sastra practitioners. I happen to be the 7th generation Vasthu practitioners. My father Jyothisha and Vasthu Rathna Sri. 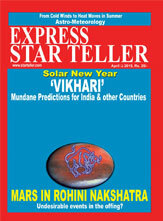 Sowma was the 6th generation Astrologer and Vasthu Pandit. After completing my school, my father insisted that I should learn this divine art and then he appointed a pandit for teaching. He himself also taught me advanced techniques, which were not available in any text book of those days and gave me practical knowledge. 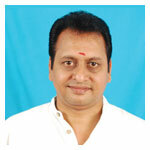 Between 1984 until 1994, I followed my father and gained practical experience in the field of Vasthu Sastra. Could you explain in simple words what is Vasthu Sastra? What are its basic principles? The word "Vasthu" is derived from 'vasa', meaning habitat. In Sanskrit, 'vast' is referred to as the site for construction of a residence. The word "Vasthu" refers to both the site on which a building is raised and to the building itself. "Sastra" means science. Other terms that refer to the same topic include the art of placement, science of architecture, science of construction, science of dwelling, science of energy flow, and law of nature. It is believed that Vasthu Sastra developed sometime around 10,000 BC and subsequently one can find reference to it in the holy epics of Ramayana and Mahabharata, in an era when philosophy was a way of life. In the ancient Vedic literature, especially in the Matsya Purana, the 18 originators of the science of Vasthu Sastra are mentioned. Among them, Maya the great scientist, architect and town-planner of old India is generally recognised as the author of Vasthu Sastra. The science of Town-planning, during the Vedic period (2500 BC-200AD), was given paramount importance to the extent that Indo-Aryans perfectly shaped human settlements into various categories, depending upon the characteristics of the population. The application of Vasthu Sastra extended not only to residences and temples, but also to military barracks, market places, ports, administration buildings and, of course, palaces, of which many have withstood the test of time. Vasthu Sastra goes beyond architecture. Ancient masters have recorded its principles. which encompass the geological, geophysical and, above all cosmological and celestial. In ancient India, architecture, medicine, astrology, philosophy and spirituality exist in complete cross relations to one another, their boundaries overlapping and enriching one another. Are the principles of Vasthu applicable to modern constructions of multi-storey buildings or flats? How? Is Vasthu effective, only within India, where it originated? When thinking of buying property, Vasthu Sastra suggests landed property is the best choice. However, more highrise residential properties are being built in areas, where land is scarce, so people might not have a choice in the type of property they buy. While Vasthu Sastra principles are difficult to put into place in non-landed, high-rise property, it is not altogether impossible. Survey the entire plot and ensure that it is Square or Rectangular; irregular shapes with cuts and extensions are inauspicious. Make sure that the main entrance to the high rise is not in the inauspicious south-west quadrant. The ground should be flat or higher in the South and West, and lower or depressed in the North, East or Northeast of the plot; if the plot is slightly projected in the Northeast, it will bring prosperity and happiness to the property occupants. It is ideal, if the apartment building's plot is bounded by roads on all four sides; avoid a block, where the main entrance is facing a T-junction, as this is a major fault. If the space surrounding the block is unequal, there should be more space in the East and North, than the South and West; ensure that there are no tall structures like mountains or buildings in the North, East or Northeast of the apartment block's plot. 1. Buy the property Square or Rectangular in shape. 2. Buy the property, that will be always in higher level than road. 5. Buy the property, if the river or ponds are on Northern or Eastern side. 8. Buy the property from rich people. 9. Buy the property, only after completing exhaustive Vasthu analysis. 2. Don't buy the property, which is near to the temple, mosque or church. 4. Don't buy the property, that emerged from bankruptcy. 6. Don't buy the property, with corner-cut. 8. Don't occupy the house, before doing house-warming ceremony. 9. Don't take Vasthu advice from inexperienced and not well-versed people. Could you recommend result-oriented remedies, to rectify structural defects, without tearing down walls or demolitions? One of the purest forms of rectification in Vasthu Sastra is the placement of Yantras (Mystical diagrams) in the eight cardinal compass directions of a property. It is a powerful product used in Vasthu correction of a negative environment, and proper placement of the diagrams has been found to provide a cure for the negativity that afflicts the property. The Yantras are divided according to the five elements (earth, air, fire, water and ether) and are available in Gold, Silver or Copper. Each Yantra has a different purpose and is either buried or hung on the walls, in the eight sectors of a property. They are used for a dweller, seeking contentment, comforts, education, success and love. They remove restlessness, and avert failure and troubles. They bestow wisdom and respect, create affection, and remove worries and bring success in the effort to seek spirituality in solitude. The Yantras are blessed with "Kumkum" prior to the ceremony. The recommended use is on the land of a new property (residential or commercial) for a building that is unable to have the things arranged according to Vasthu rules. Yantras should be placed, before the building is constructed and it should be done by a qualified Vasthu expert. It involves a prayer ceremony, to nullify the negative effects in the ground and renew the gravitational power of the Earth. Just as a mantra is a sound composition, a Yantra is a geometrical composition that reveals a particular energy configuration, whose power increases in exact proportion to the abstraction and precision of the diagram. Used together with a mantra or seed sound syllables, each Yantra displays the patterns of force, heard in the mantra. Once a dweller has performed this ceremony, the power of the Yantra buried in the particular plot can last for 60 years. Are Vasthu Sastra tenets quite effective for modern-day offices? The ancient science of construction (Vasthu Sastra) doesn't just apply to a home. A place of business should also be in tune with the five elements of ether, air, fire, water and earth, so that the Management and the employees work in harmony, to achieve success. The Managing Director of the office should occupy the Southwest quadrant and should face North, while sitting at his desk. The flooring in the room should be 7cm to 15cm higher than the rest of the office. His or her Table should be in the extreme Southwest corner of the room, and it would be auspicious, if the door to the room were in the Northeast quadrant. The second person in command, like a General Manager or Manager, should occupy the South and West quadrants. He or she should sit facing North, while occupying a Southern room and should face East in a western room. All other staff should sit facing East. The Finance Manager should sit in the North quadrant facing North or East, as this will yield enhanced financial results. Tables or counters should be designed in such a way that Sales persons face either East or North and the customers face West or South. The Sales staff should occupy the Northwest quadrant. The administration and Human Resources departments should be in the East. If the office has a prayer room, it should be located in the Northeast and should be kept clean and free from weight. 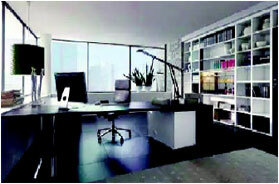 Showcases, racks and cupboards should be against Western and Southern walls. The Reception should be placed in the Northwest and the water cooler or dispenser should be placed in the Northeast corner. If the office has a pantry, it is highly recommended that it be placed in the Southeast quadrant. There must be no toilets or pantry in the Northeast and Southwest corners. People in decision-making positions should avoid sitting under a beam, as they may find it difficult to make the right decisions. Such beams can be concealed by false ceilings. The centre of the office should be kept empty. Workspaces, too, should be harmonized as much as possible, because many people spend the prime hours of the day at work. Even if the space does not belong to you, you spend much time in it; neither is it simply a "temporary" space. Rushing through work and not respecting the environment can cause tension and hostility to the individual. A Vasthu Sastra-friendly office can help foster a strong harmonious relationship between the occupant and his or her colleagues, so the space should be treated with respect. The shape of the plot where the office is located should be square or rectangular, if possible. Buildings, too, should be the same as "cuts" and "voids" can distort the flow of positive energy. Taller buildings or flyovers should not overshadow the property. Never choose a shop with the entrance in the Southwest, as it will invite trouble and financial problems. As with a house, the main entrance of the commercial space should not be obstructed by power cable poles, trees or tall structures. The office should be properly lit and have adequate ventilation. Natural lighting wherever possible is important, because long exposure to fluorescent lighting can harm the natural balance of the human body. Have you ever wondered why all factors such as quality, location etc being equal, still some restaurants attract a huge number of patrons, while others can't attract much? Vasthu Sastra could explain why. 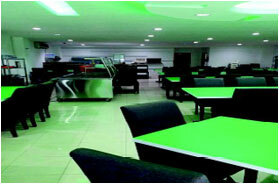 A restaurant arranged according to Vasthu principles is likely to see a constant flow of customers. A restaurant's main entrance should face North or East, auspicious directions for food-related businesses. In a North-facing restaurant, the Cashier should sit in the Northwest quadrant facing East. In a South or West-facing property, the Cashier should occupy the Southwest quadrant and face East. In an East-facing restaurant, the Cashier should face North or face East. Of course, the kitchen's location is every bit as important as the cashiers'. Meals prepared in the correct location tend to taste better, and that, of course, would ensure a regular clientele. The first choice for the kitchen is the Northwest (Air) quadrant, with chefs facing North, when cooking. The second choice is the Southeast (Fire) quadrant, with chefs facing East, when cooking. If a sub kitchen forfrying or preparing Barbique and tandoori dishes is required, its stove /grill / tandoori oven should be located in front of the premises, in the Southeast or Northwest. The ideal location for the display of sweets and cakes would be in the Northwest. This quadrant will ensure desserts selling fast. Groceries and foodstuffs should be stored in the South, West or Southwest. The toilets should be located in the Southeast, South, West or Northwest; the Wash Basin is to be in the East or North. A bowl of water or fountain can be placed in the Northeast quadrant, which is the Water corner. Tables should preferably be square or rectangular. Kindly explain two Case-studies, (i) Residential flat (ii) Business premises. You can indicate even a case, where Vasthu recommendations could not be carried out. Residential flat(Problem could not be rectified here) Businessman Mr. Steve has decided to vacate his doublestorey house, which has a Southwest entrance and facing a T-junction. "I have been staying in the house for eight years and I discovered that the woes I have been facing is due to bad Vasthu Sastra. I have been suffering heavy financial losses and law suits and the harmony in my house was disturbed," he said. After Vasthu consultation, it was found that he could not rectify the problems in his house, owing to two major faults: a Southwest opening and a T-junction. In Vasthu Sastra, the only Compass direction, in which it is inauspicious to have a front entrance is the Southwest; and facing T-junction just makes things worse. Wealth will not flow into such a house. Southwest is the Master's quadrant and it must not have any opening, as the positive energy that is supposed to be stored in the property will exit. Steve said that he would be moving into a rented property facing Northwest next month and wanted to sell off his property. There was no other way. Business Premises(success, after Vasthu correction) Anthony Das, Managing Director of an IT company, was surprised to discover recently that for the past two years he had been working, while sitting in the Fire corner (Southeast) of his office; because of this, he often had conflicts with his employees. He said that he was unable to control some of his Staff that occupied the South-west (Master's) quadrant. After learning about Vasthu Sastra, Das re-arranged his office and turned the Southwest corner into his room and had his workers moved to the Northeast and Northwest sectors. He said, "I feel a lot better personally because I'm much calmer and my relationship with them is more cordial now"